Champion’s Award winners “FFL’s The Inside Joke” from Fayetteville plot their next move. 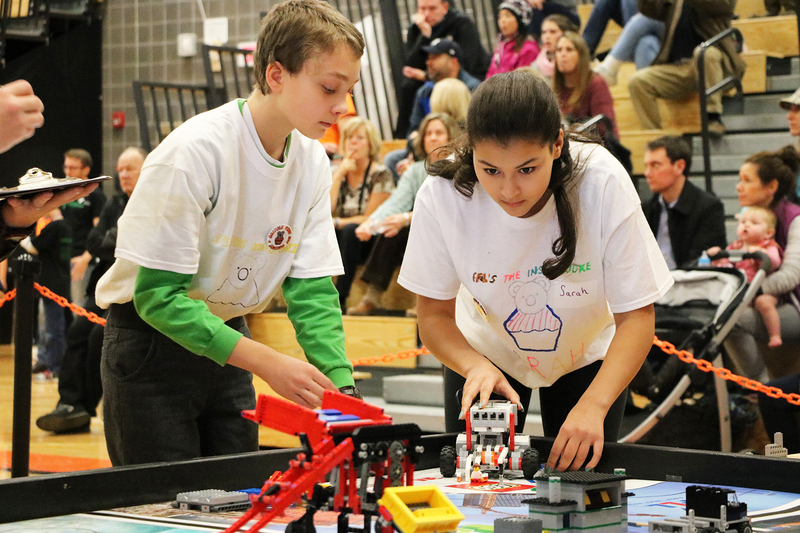 MEXICO – Mexico Academy and Central School District hosted the FIRST LEGO League Challenge regional qualifying event for the second consecutive year, and it was once again a huge success. 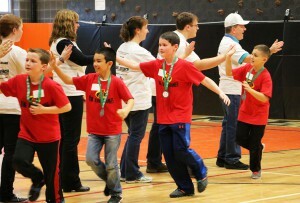 Central Square students run through a “high-five” line for receiving the Judges’ award. This year’s theme was “Trash Trek Challenge;” students in grades 4-8, in groups of up to 10 students, explored the world of trash, compost, recyclables, landfills, sanitation and more, as well as occupations that relate to these topics: city planners, sanitation workers, environmental engineers, etc. Students were challenged to think about the technology that people use to turn trash into something new. Mexico students Alex and Trevor create a plan of attack for the FIRST LEGO League Robot Challenge. The competition is divided into three parts: the Robot Game, the Project and the FLL Core Values. 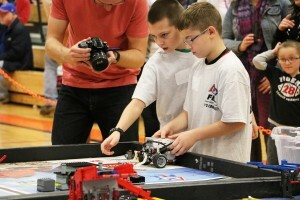 The Robot Game requires students to program autonomous robots to score points on the trash-themed playing field; the project involves brainstorming a solution to an identified problem. SUNY Polytechnic Institute facilitates three qualifiers for upstate New York FLL teams in November: one in Mexico, one in Utica and one in Ilion. 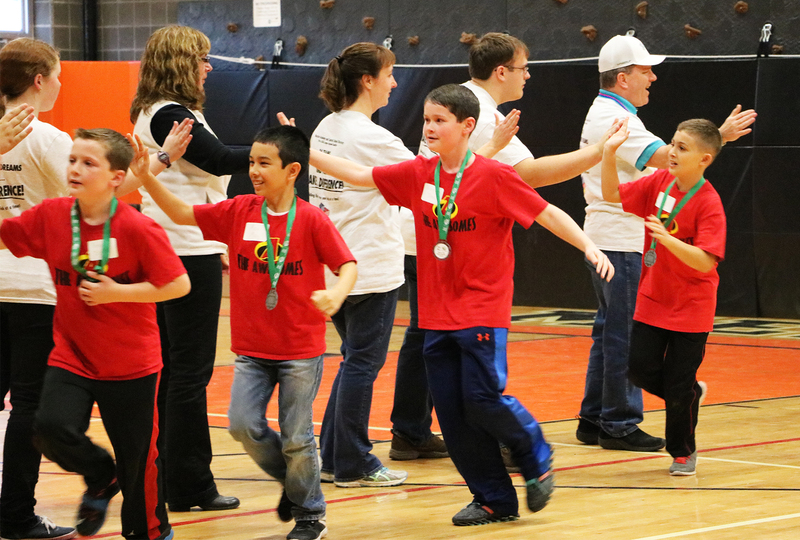 24 teams from these events will continue on to the Championship competition held on SUNY Polytechnic Institute Utica campus on January 16, 2016. 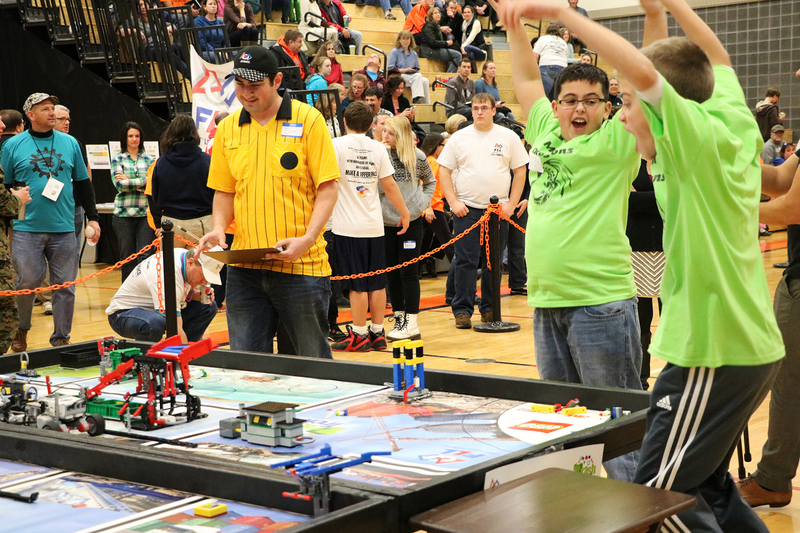 The Camillus “MGM Dragons” show their excitement during the challenge held at Mexico Middle School. Central Square’s “The Awesomes” team took home the Judges’ Award. The judges said “The Awesomes” showed incredible improvement from last year’s competition, taking all that they learned to make adjustments this year. In recognition for research and presentation of an innovative solution to an identified problem, Tully’s “Eco-Bots” received the Project Award; they also received the Robot Performance Award. 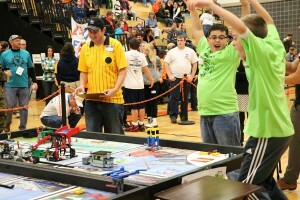 Tully’s “CyberTechno Knights” earned the Robot Design award.